The maps can be used as a link directory for the basic layout of the terrain features (part 2 of the design document). The map links will open a second browser so you can keep linking from the map. If you want the rest of the design document then please go to the "Contents" page. This is the Nemo's Island prototype. It shows the relationship of all the different areas and the relationship of the different environments. The island may change shape with input from the public and once the original design document is fulfilled it could of course grow in size by just adding more real estate to the shore areas - but most likely the island will be big enough that evolving ideas can just be modified within the existing terrain. The map was made using Terragen!! - it is a true artist tool by the fact it is powerful and flexible enough that it was used here for a different purpose than it was really designed for. The landscape pictures below are examples of its use - we will use it for our sky-boxes. This program may seem special purpose but I am still learning more about it - so like I have found - it is powerful - and has just gone shareware - I did the map in version 6 - version 7 is out now! 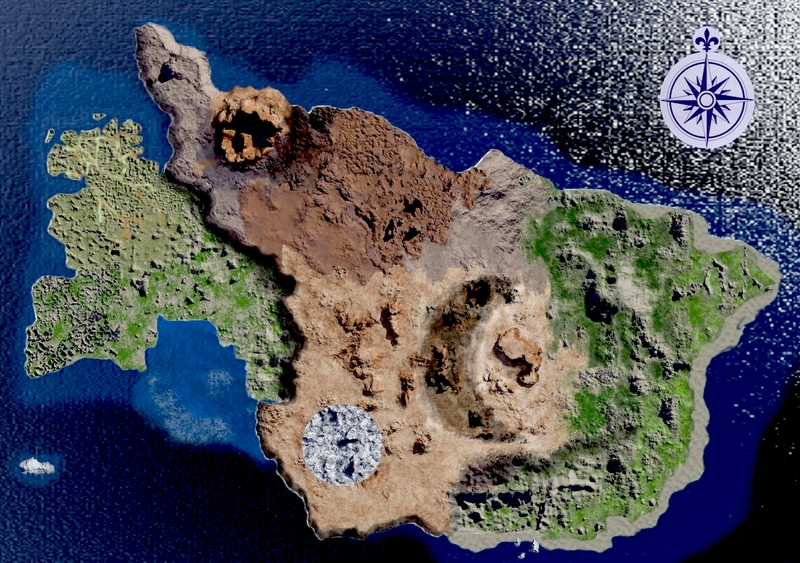 Note: the maps in the 3 Level Plan are not good examples of Terragen's beauty. They are taken from a vantage too far up and not anti-aliased. Click here to go get Terragen at their official site. Click here for a website that has monthly contests with Terragen users.